Welcome to Panoramic Paradise Landing. This phenomenal lake view home has all the comforts and one step better. The outdoor 500ft veranda overlooks the unobstructed amazing views of the lake, mountains, and Mount Konocti. Numerous native birds pass by including Eagles, Osprey, Herons, American White Pelican, Yellow-Headed Blackbird & the Western Grebe. Sip coffee on the deck to the rising sun and enjoy the gas fire pit on a crisp spring morning. Enjoy barbecuing on the veranda, visiting with friends, and sipping a glass of wine from one of the many local vineyards. 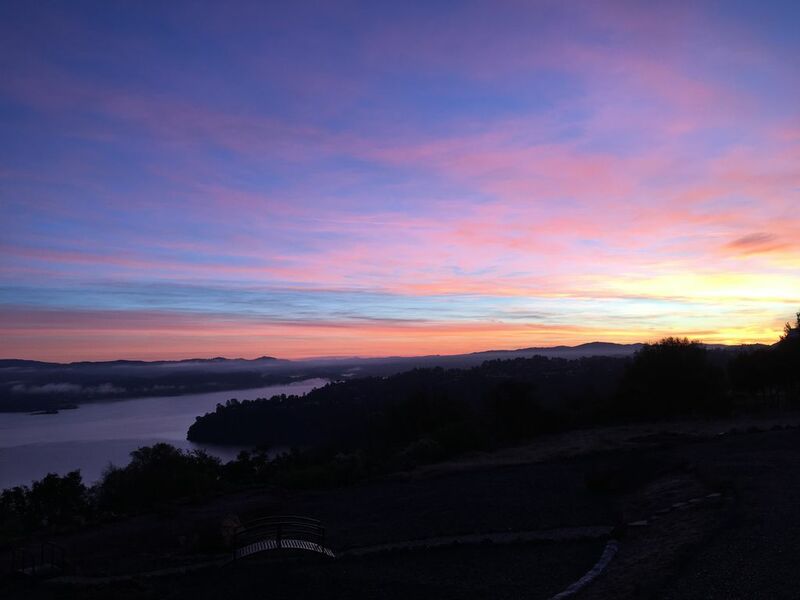 Kelseyville is in the Red Hills AVA where our 3 favorite wineries reside. Laujor Estate Vineyard, Thorn Hill Vineyard & Boatique Winery are just a few of many wineries in Lake County. Each offers great wine tasting and beautiful settings. Relax with a bottle of wine and a picnic lunch. Does not get much better! We are on 6 acres with plenty of space if you have a boat or Sea-doo. The home is a short drive to the lake with launching access. This 2br, 2bath home has all you need: full functioning kitchen, with center island and seating for 4; living room space with chase lounge couch and two comfy chairs; cable, internet, washer, dryer provided. Bedroom 1 is spacious & has a Queen bed. Bedroom 2 is the master with queen bed, dresser with plenty of drawers for clothing storage, plus a very spacious closet. Heat & Air Condition. Fully furnished veranda with plenty of seating for relaxing & entertaining. Dinning table outside comfortably seats 6 with gas BBQ. Lounging area with 2 loveseat gliders and 2 chair gliders, making it comfortable for resting, reading or just taking in the peaceful view. Summer time pool pass to the Riviera Hills Country Club, also includes tennis courts and use of the facilities. We offer a day around the lake wine tasting adventure, 4 or 6 hour for the Lake County wineries. Or a 6 to 8 hour wine tour to Napa County. We drive you, worry free. If interested please inquire for cost for this service. Whether for a weekend get away or a weeks vacation, Panoramic Paradise Landing will bring you back in balance. Hello we are Rose & Nancy. We are happy to share this magnificent property and home with you. This home for us with this most amazing view was or dream vacation home. We bought this home for what we like to call our Zen time and returning to balance. With the way life goes we all forget to stop and reflect on whats important and that is nature, balance, mindfulness, reflection, community, friends and family. And our home and property offers all of this and more. We hope you will enjoy what we have strived to accomplish for rest, relaxation and Fun! Or what I also like to call is my ZEN DEN. THE VIEW~THE VERANDA~THE EXPIERANCE~THE SERENITY~ You will not want to leave. We all live very fast pace lives and we forget to connect with what is important. We have set the tone for our vacation home to bring everyone that chooses to stay back to balance. I promise you that. We work very hard to make you feel special. When you arrive you will be greeted with a bottle of wine to enjoy your first night while breathing deeply and melting into the view from the veranda. We want everyone to feel the amazing feeling we have each and every time we are at our home. From the comfort of AC on a very hot day. To coming out of the shower and wrapping yourself in on of our plush white towels. Listing to music on the veranda, eating snacks while playing cards. What ever you do you will feel the deep connection of love for this beautiful place. We offer a worry free package for wine tasting in Lake or Napa County. We pick you up drive you to your chosen winners and deliver you safely back to you vacation rental. Fees for this service is separate from you rental booking. Inquire for pricing. electric built into tv stand. Coffee, teas, assorted spices, oil, cooking spray, mayo, mustard, ketchup, butter. Cards, dominos, SkipO, Mexican Train, Sorry, Monopoly, Battle Ship, Corn hole, and Deck Jinga. Riviera Hills Country Club Pool pass for up to 4 guest. Operating pool hours are Wednesday-Sunday 1pm-7pm. June though Labor Day weekend. Everything you would need is there. They had llots of extras in the bathrooms Awesome view. I had a few questions during our stay which was over 2 months and the owners always got right back to me . My wife and I stayed two months and really enjoyed ourselves. We really liked the wild life visits and the very peaceful deck. The area had everything we were looking for in good food, golf and casinos. Nancy was a great host and proved for our every need. we would stay again and probably will. The only thing I could possibly complain about is no lids for pots or pans which was not a big deal. It was a pleasure having you both. We do hope you come back again, and when you do we will have lids for the pots and pans for sure. Thank you for choosing to stay at Panoramic Paradise Landing. My wife and I usually get together with one of her sons and his wife in November or December to celebrate both Thanksgiving and Christmas. Since we are about a two-day drive from each other, we meet halfway and stay in a motel. We wanted to do something a little more special this year, so we decided to rent a cottage on Clear Lake, CA, which would be about a 7 hour drive for each of us. We ended up enjoying our time together so much that I'm sure we will do it again. Panoramic Paradise is aptly named, as it is situated on a hill overlooking a large portion of the lake. The view is gorgeous! We spent four days there and had a little rain and fogginess, but the majority of the time we could relax and take in the beauty of the surroundings. Several deer came into the yard periodically, looking for food, which we were happy to provide just to keep them around for a while. We brought way too much stuff with us as we found the cottage to be much better supplied than we'd expected. The Vellas thought of everything and the wine they left for us was delicious! I heartily recommend Panoramic Paradise to anyone looking for the same pleasant experience we enjoyed. A beautiful house on a wonderful spot! We are so glad you enjoyed yourselfs. We hope you enjoyed the bottle of red for our favorite local Vineyard, Laujor Estate. We hope you will come again. Relaxing vacation at a beautiful Clear Lake home! My husband, 5 year old son, mother and I had a great time staying at this lovely home. The house is comfortable and extremely well organized. The view was amazing! We spent the mornings swimming at Clear Lake and afternoons/evenings relaxing on the deck. It was thte perfect spot for a great vacation. make sure everything is cleaned when you leave . Has everything you'll need (bring dvd player) if want to watch movies. Top notch furniture on deck,Mt Konocti right next to you. Thank you for your review. A DVD player is a great idea. I hope you enjoyed the special bottle of wine we chose for you to enjoy when you arrived. I’m a bit confused if everything was great, it doesn’t match your rating of our property and your experience. But all your suggestions are duly noted and being worked on to better the experience of our future guest. There are over 30 local wineries to the Lake County wine region. Only a 45 min drive to Napa County.